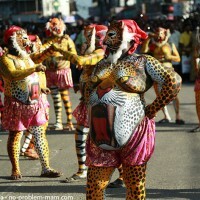 In Thrissur, the Onam celebrations end in high style with hordes of portly human tigers thronging the streets, dancing to the hectic rhythm of the percussion. 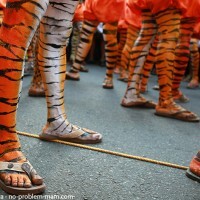 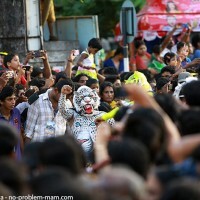 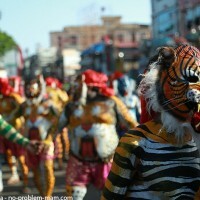 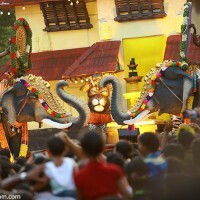 The Pulikali or “tiger dance”, deeply rooted in Kerala culture, is a unique event and a good-humoured, convivial moment of entertainment. 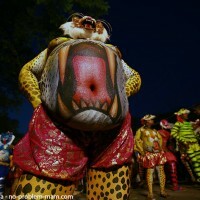 Puli means “leopard” or “tiger” and kali is “play”. 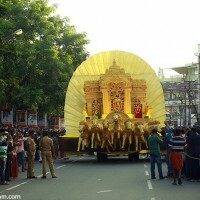 The Pulikali dates back more than 200 years; it was dreamed up by the Maharaja of Cochin, Rama Varma Sakthan Thampuran. 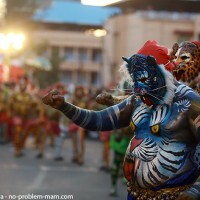 The tiger dance takes place in various parts of Kerala during the Onam harvest festival, but the town of Thrissur is the venue most renowned for the tradition; each year over 800 “tiger men” from a dozen nearby villages take part, to the delight of thousands of spectators. 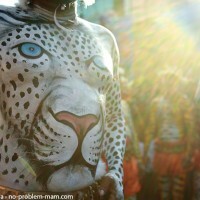 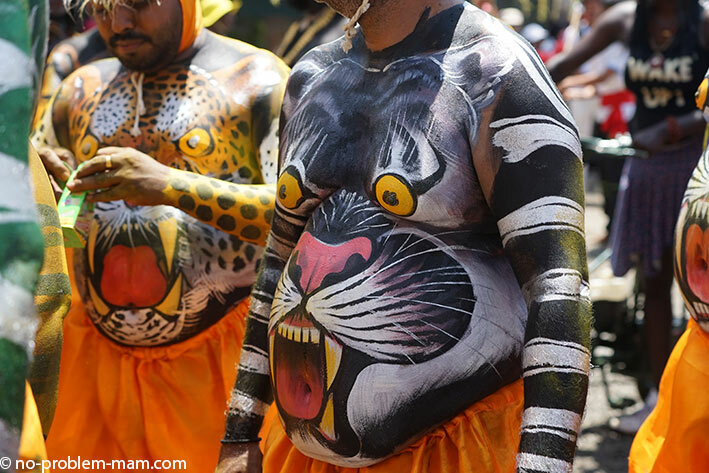 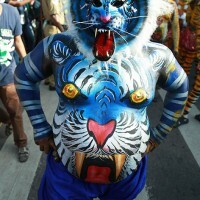 What is special about this festival is the very impressive body makeup, with realistic-looking tigers’ or Leopards’ faces painted on the dancers’ chests and plump bellies and tiger stripes on their arms and legs. 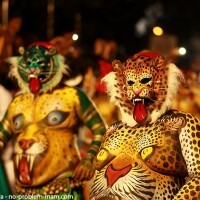 The painting is a meticulous process that takes five to seven hours, often starting in the small hours of the night. 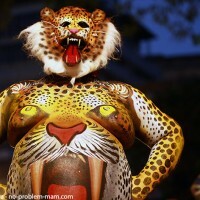 First a base coat of paint is applied to the dancers’ smoothly shaved bodies; then a second coat of paint produces the design. 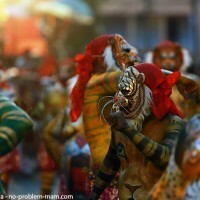 The dancers used to have their faces painted as well but nowadays they wear ready-made tiger masks. 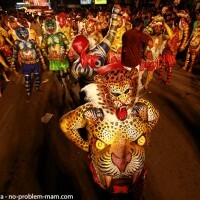 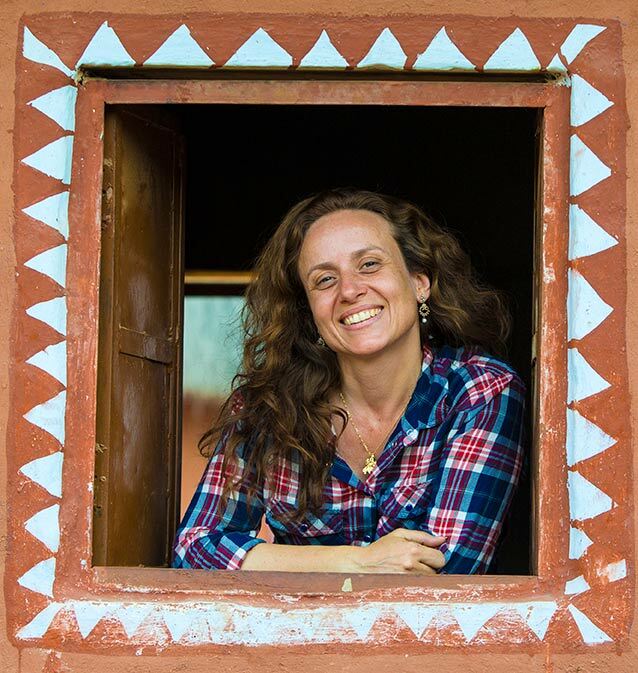 From afternoon to nightfall, Pulikali groups or sangams set off in procession through the streets of Thrissur dancing, pouncing and shaking their bellies, pursued by hunters armed with rifles. 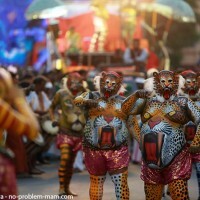 With udukku and thakil drums setting the beat and adding to the noise it’s an exciting afternoon.